The primary colours in light are blue, green and yellow. You can see it written as RGB (red, green and blue). By mixing primary colours, we can create the rest of the colours. If, for example, we mix red light with blue light, we create magenta light. If we mix the same quantity of red, green and blue, we create white light. Televisions and computer monitors use this additive system to create colour. Subtractive primary colours are cyan, magenta and yellow, which are the primary colours of pigments. What are pigments? Pigments are chemicals that absorb a portion of light. Let's see an example for you to see this point clearly. If, for example, we mix cyan with yellow, we create green. Blue light and red light are absorbed by pigments and just green light is reflected. As a result, we just see the green light. Subtractive primary colours are used when mixing paint and in printers. 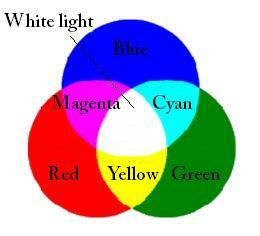 This is why printer cartridges are cyan, magenta, yellow and black (CMYK). Let's see another example. Imagine we have a T-shirt which absorbs blue and it is being illuminated by white light (same quantity of red, green and blue). The T-shirt will only reflect red and green, which form yellow. As a result, when we look at the T-shirt, we will only see yellow. Complementary colours are 2 colours which when mixed produce white light. For example, when we mix blue light with yellow light (red and green), we create white light. The 3 pairs of complementary colours are blue and yellow, green and magenta, and red and cyan. When 2 complementary colours are used one next to the other in an image, they produce high contrast and colours seem brighter and more saturated.If, on the other hand, we use 2 colours which are next to each other in the colour wheel, such as green and blue, the image has less contrast. 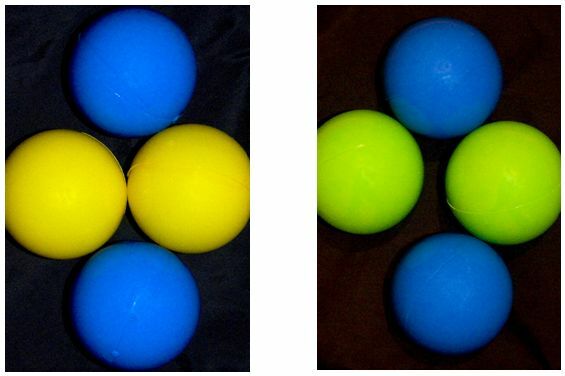 In the 2 images below, we can see an example: in the first picture, we used 2 complementary colours, blue and yellow; In the second picture, we used green and blue.